Choosing the best shower valve is critical if you are to enjoy a refreshing shower early in the morning as you prepare to step out, or after you get horns after a hard day of work. Like any accessory, the shower valve will develop fault over time because of aging, wear, tear, poor handling or bad installation. It will be hard to operate, won’t deliver the right pressure, will develop leaks, or the performance will degrade. When this happens, you need to replace the faulty unit with a good quality piece. You may also be installing a showerhead the first time and would like a reliable, efficient, and durable product. But with all kinds of information and products on the market, it can be tricky to know which the best is. You may also lack adequate knowledge about the products. By the time you finish reading this review, you’ll be wiser is to picking a shower valve. Since it is a crucial section, it is therefore important to find the best one from many if you are interested in buying one for your bathroom. Finding the best is painful but out of the many reviews, the following are the best. Starting us off is the R10000-UNBX unit from Delta Faucet. It’s a common option for many people and the majority state that it’s easy to fit. This benefit comes handy for newbies or inexperienced people who lack sufficient knowledge for installation. According to consumers, it works well with most standard plumbing and shower unit should deliver decent pressure. We noticed that it’s made from brass, a material that is famous for tolerance to corrosion, pitting, chipping, rust, and tarnish. This means that it will keep its elegance even after many years of use. It works with a single as well as dual cartridges and you don’t require altering the plumbing to fit it. Our research led us to the Kohler GP77759 which should work with many units including the Rite-Temp shower valves. The unit looks and feels solid and ought to have no trouble handling different water pressure. It works with 1 /2-inch pressure balance and is therefore compatible with most standard plumbing. On trying to fit this unit, we discovered that it doesn’t require complex skills or tools. In fact, a person with basic knowledge should manage to fit it in a short time. The handle rotation appears to be smoother than most of its close rivals and this is probably due to better technology. 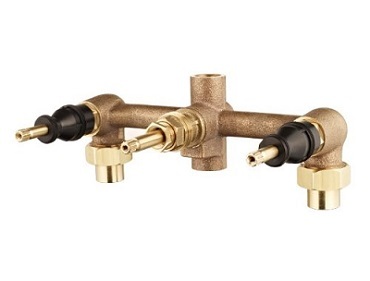 Also making its way in this shower valve review is this product from Delta Faucet. The Delta R11000 just like its earlier stablemate (R10000-UNBX MultiChoice) is made of brass. This material has a better reputation in comparison to other options in regards to strength, durability, rust/corrosion resistance, and handling pressure. The manufacturer states that it should be safe to use with water pressure up to 300 psi and maximum air pressure 200 psi. With such specifications, this unit is okay for everyday home requirements. You should nevertheless use the supplied or recommended cap for the desired performance. You’ll also notice that it works with a 6 or 3 function diverter rough. 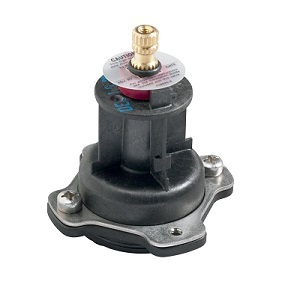 The 2510 Monticello PosiTemp valve from Moen replaces different models in the market. 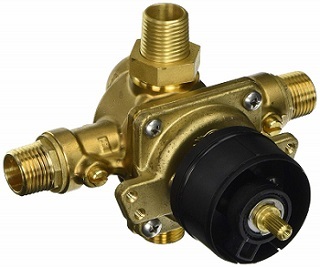 It’s made of premium brass to prevent corrosion, fading, rust and also handles different water flow pressure. The pressure balancing unit is fit for existing as well as new installation and features 1 /2-inch IPS. Like the rest of the featured items, it is quick to install and doesn’t leak once installed. The built-in 1222 cartridge supports back-to-back installations and works with M-PACT trim kits from Moen. It features PosiTemp technology that assists in maintaining the water temperature. Many consumers and analyst believe that the K-304-K-NA is the best in the market. One thing we agree with them is that it does have many outstanding features and can handle a wide range of pressure. This means it provides decent water flow and excellent performance. 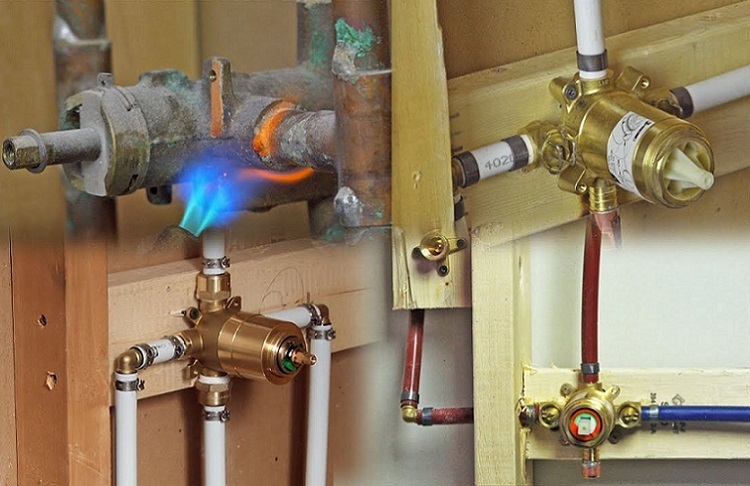 The pressure balancing valve supports back-to-back installation and this makes it a top choice for plumbers and homeowners. By placing the mounting tabs on the rough, the manufacturer seeks to simplify installation. And since it’s very simple, you can fit it using the basic tools. The internal parts are much larger than most of its competitors and this fills up the bathtub much quicker. It combats freeze-ups that are caused by water residue as well as contamination through the use of a high-quality diaphragm. This model comes with the plaster guard cap which the user attaches before installing. 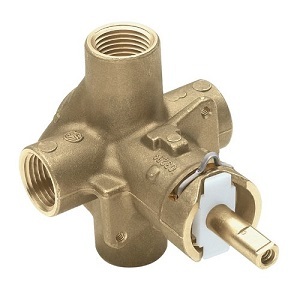 The brass of the valve is more durable with an install depth that is flexible. It has a high precision spool balancing system that makes it great for all types of showers. This brand is of top quality because of its manufacturing process which uses high technology to make it. Pfister is a leading brand in the plumbing industry because of its easy mechanism of installing it. The device is not only affordable and durable, but it also has a beautiful design with a simple system of operating the tool. 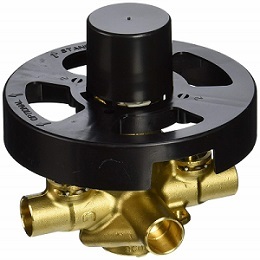 Since it is affordable and durable, the valve is also liked by many because of its quality. It offers high quality compared to the cost you will pay for it. Its compact and beautiful design makes it regulate water easily. Moen 2570 shower valve remains to be the best value in the market because of its exceptional quality, efficient operation and durability. It is made of brass and installing it is easier. Also, it comes with the cartridge that enables it to accommodate a back to back installations. Moen is designed to operate for a long time and comes with a limited lifetime warranty. When it comes to value for money, it is excellent. Made of superb technology that helps in controlling the temperatures of water when showering. Also, it is made of heavy brass construction that makes it durable and long lasting. The flow of water from this valve is absolutely generous and the user will enjoy the shower. Its advanced technology makes things easier for the user as everything will be controlled automatically. Also, this product offers more compared to its price tag in the market. Danze WK330194 is one of the best valves in the market because it allows you to control and adjust temperatures of water in the shower with high precision. The valve is valuable and appealing to customers because of its precision. This shower valve can deliver the flow rate of 16.6 GPM. Danze shower valve comes with screwdriver stops and integrated check valves. The tool is known to be the most efficient and effective valve that offers a smooth handle control. With smooth handle control, the user will not experience any leaking or dripping. It is made of high quality and hardened ceramic with an upper and lower disc. The user does not operate a lot in this brand because it automatically regulates itself. It has upper and lower disc for smooth functioning. The quality of the Grohsafe shower valve is absolutely undeniable. This is because this device showcases tectonic attention that offers perfection. It is made of a unique design which ensures that the user has a smooth valve operation. Grohsafe offers a great comfort zone as the user regulates the temperature of water precisely into the required point. 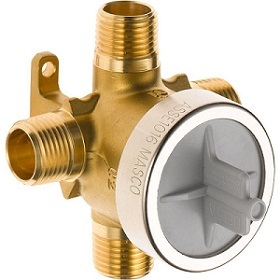 This is one of the best valves that is more efficient and effective for family use. This tool is more durable and can work as the protection against freezing and scalding. With excellent design, Grohsafe is also made in a way that it prevents extreme temperatures. Effective and efficient regulation of temperature improves the functioning of this tool. A majority of customers regards it because of its comfort zone nature it offers. SR SUN RISE is a dual function valve with wall-mounted design to offer a modern and good looking bathroom. Apart from its brass construction, the tool has an outside box made of plastic. 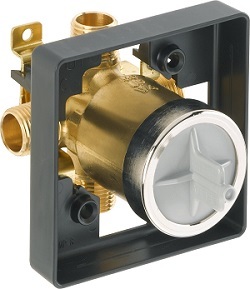 This box protects the body of the valve from any damage hence extending its lifespan. The dual function system of the valve enables the user supply and mix cold and hot water in the showerhead. This tool is also made from ceramic, making it more reliable and durable. 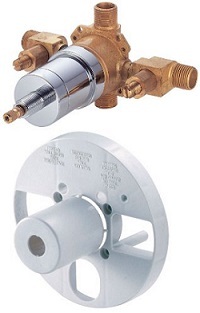 The valve is also resistant to high temperatures and its adjustments for temperatures are simple. 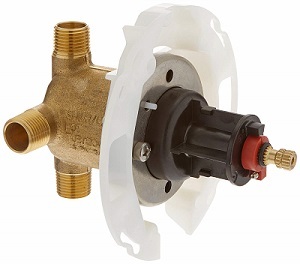 This shower valve also comes with the shower cartridge that has the pressure balancer. The balancer prevents water from getting hotter to scald the user. The attractive square design is actually one of the main reasons why many people prefer this product compared to other brands. As indicated above, the shower valve is actually a bathroom device or tool that adjusts water temperatures and ensures that it navigates the flow of water in the shower. There are many brands of shower valves in the market. However, the above brands emerge the best from many. This is because of their quality, effective cost, reliability and excellent durability. Choose shower valves depending on what they are capable of offering. 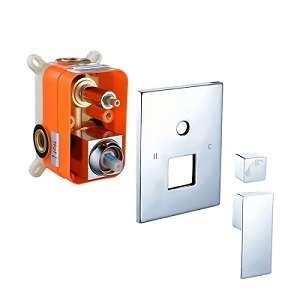 Therefore to choose the best shower valve, you must look into their durability, reliability, advanced functions and even their value for money. Choose one from the above if you want to buy the valve. The shower valve is used in controlling the flow and mix of cold and hot water in the shower. It uses the combination of diverters, temperature controls and flow controls in functioning. The shower valve may not be visible but it is the essential part of the shower. This part of the shower plays a major role in ensuring that the shower works properly as required. Choosing a shower valve can be challenging even for seasoned users. There are many good products on the market and singling out a particular one isn’t easy. You also have to understand your current requirements in regards to water flow, pressure, mounting point, pressure balancing, number of outlets, installation ease, number of controls, and much more. To aid you in the search, we have listed down the top shower valves on the market. We chose products that are easy to fit, leak-proof, work with standard plumbing, require basic skills and effort are water efficient and can handle different water pressures. Taking a relaxing shower while optimizing water usage is as practical as choosing a good item.